A little fruit can be beneficial to your dog’s health, but consumption often comes with a caveat. Understanding which parts of a melon can be safely consumed by your dog is vitally important. Can a dog eat the skin of a watermelon? While the bright red flesh of a watermelon is suitable for dogs to eat, the seeds and rinds (skin) of the fruit are best avoided. They are not toxic, but the rind can cause diarrhea, and the seeds can block your pet’s digestive tract. Trim these parts away before feeding it to your dog. This article will address any concerns that you may have about giving your dog watermelon as a treat. While watermelon has an assortment of health benefits, it does have some drawbacks. 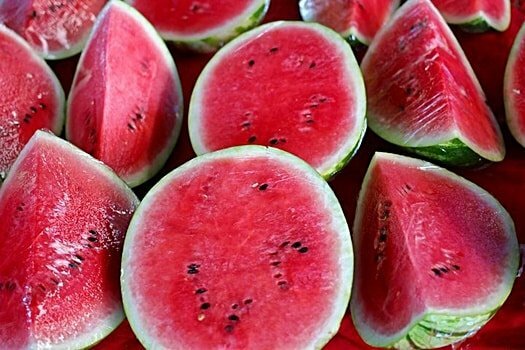 1 Is Watermelon Toxic to Dogs? 1.1 Is Watermelon Healthy for Dogs? 1.2 How Much Watermelon Can a Dog Eat? 1.3 Can Dogs Eat Watermelon Rind? 1.4 Can Dogs Eat Watermelon Seeds? 1.5 Can Dogs Eat Seedless Watermelon? 1.6 What If My Dog Ate Watermelon Seeds? 1.7 Can Puppies Eat Watermelon? 1.8 Can You Give Dogs Watermelon Juice? 1.9 Does Watermelon Cause Allergies in Dogs? 1.10 Can Dogs Eat Cantaloupe? 1.11 What Other Fruit is Safe to Feed My Dog? 1.12 What Fruits Should I Never Feed My Dog? Is Watermelon Toxic to Dogs? Watermelon is not toxic to dogs in and of itself, but the precautions concerning the rind and seeds of the fruit should not be taken lightly. You shouldn’t offer too much watermelon to a dog that has never eaten the fruit before either. Introducing any new food to a dog must be done slowly and steadily. Is Watermelon Healthy for Dogs? 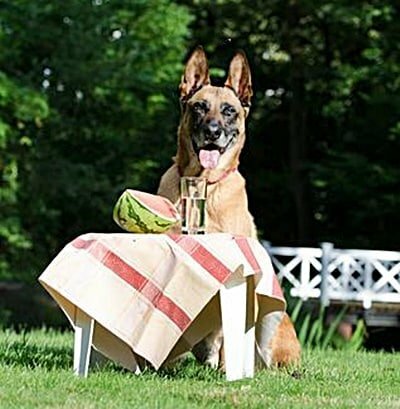 Watermelon is a treat for a dog as the fruit is comprised almost entirely of water. This means that it’s hydrating, working to restore lost fluid as well as energy when your dog is bounding around the summer sun, and it’s also low in calories and contains no fat or cholesterol. 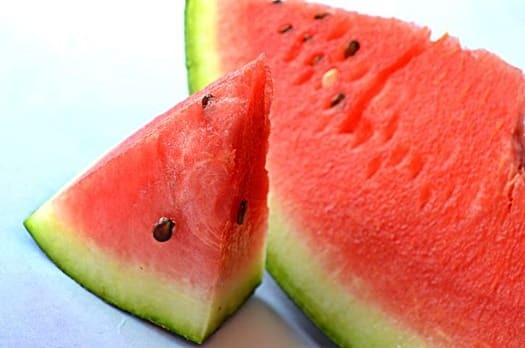 There is still sugar to be found in watermelon, so don’t go crazy and dole it out to your dog with abandon, but it can be a beneficial addition to their diet if consumed sensibly. Vitamin A, which keeps your dog’s coat and skin in tip-top condition. 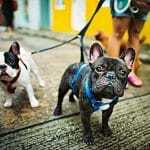 Vitamin B6, to ensure that your dog’s internal organs remain strong and healthy. Vitamin C, to boost your pet’s immune system and head off colds before they take hold. Potassium, which will keep your dog’s muscles and nerves functioning well, and ensuring that fluid pumps around their body and keep their joints supple. With all of this in mind, it’s hard to imagine that there is a downside to watermelon. Don’t lose sight of the sugar content that’s found in the fruit, though, as too much may leave your dog at risk of developing diabetes. The red flesh of a ripe watermelon is great for your dog if fed in moderation, stripped of seeds and separated from the fruit’s rind. How Much Watermelon Can a Dog Eat? Any fruit will need to be used in moderation for a dog, as too much can result in an upset stomach. Watermelon is no different, and when you first introduce your dog to this new taste sensation, you should start small. Don’t pile up a bowl, as you’ll be at risk of having one heck of a mess to deal with afterward. Just hand-feed a bite-sized taster, with the seeds and rind carefully removed. If your dog takes to the taste, limit them to a few slices and carefully watch them for the next hour or two. You’ll also need to take your dog’s size and weight into consideration when deciding how much watermelon to offer them – small dogs are more likely to suffer a stomach upset brought on the acids found in the fruit. Watermelon is undeniably good for dogs, but there can be too much of a good thing as far as this fruit is concerned. Make sure that your dog has access to the bathroom after eating, as they will be very hydrated and may face a rebellion from their stomach if their digestive tract rejects the melon. If not, however, do feel free to offer your dog a few slices each day as a healthy, hydrating treat. Can Dogs Eat Watermelon Rind? The rind of a watermelon can be harmful to a dog, and you should keep this part of the fruit away from your pet. Once you have managed to extract the flesh of the watermelon, toss the rind away. The rind of this fruit isn’t toxic or poisonous, so there is no need to fly into a panic if your dog somehow manages to get his hands – and mouth – on it. The trouble comes when your dog tries to eat the watermelon rind, as it is extremely tough and leathery. Some dogs love this and will take a great deal of entertainment from chewing away and never bothering to swallow. That’s fine. If your dog does grow tired of eating and wants that sweet watermelon flavor, however, the rind of the fruit can cause stomach upsets – and there is no way of being sure that your dog will successfully chew the rind into small enough spaces. If you catch your dog eating the rind of a watermelon, take it away and toss it and keep an eye on your dog. If they give any indication of looking to dash for the bathroom, quickly take them out unless you want to be mopping and cleaning the floor of your home. Can Dogs Eat Watermelon Seeds? No, dogs should not eat the seeds of a watermelon. If you are going to feed this particular treat to your dog, you should spend a few minutes removing the seeds from the center of the fruit before doing so. The reason for this is not that the seeds of watermelon are toxic or poisonous, but they are tough for your dog to digest. Your dog will be reluctant to chew or crunch on the seeds as they will be tough and potentially hurt their teeth – even breaking them in a worst-case scenario – so they’ll swallow them whole. This leads to an immediate risk of choking, but if your pet does manage to swallow them down, the seeds will sit in their digestive tract and fail to break down. One or two seeds will not have any significant impact on your dog, so don’t worry if you miss a couple while preparing a snack. Just don’t grow complacent, as if your dog decides to wolf down a whole bowl of watermelon seeds a trip to the vet may become necessary. Can Dogs Eat Seedless Watermelon? Yes, they can. Obviously, the risks surrounding the use of rind still apply, but if you pick up a seedless watermelon your pet will not be at risk of eating them – and you’ll also save yourself the job of plucking them from the fruit yourself. One thing that should be noted is that a seedless watermelon will rarely taste quite as saccharine as their seeded counterparts, so if your dog prefers sweet tastes, you may find that they lose interest in the fruit before long. 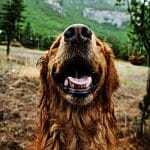 You could try mixing a little honey to boost the flavor and appeal to a sweet-seeking dog’s sensibilities, but you may be just as well looking for an alternative snack that offers just as many nutrients. We discuss other fruits that offer a boost to your dog’s health elsewhere in this article. What If My Dog Ate Watermelon Seeds? If your dog eats watermelon seeds, try not to panic as that will not help anybody. Also remember, the seeds of watermelon are not poisonous, so there is no need to take your dog to the vet. Too many watermelon seeds will cause your dog to experience an internal blockage. It will take many to have this impact though, so there is no need to race to the emergency vet if your dog has curiously sampled a solitary seed. Sudden and unexplained weight loss. Dehydration, and an inability to quench a sudden thirst. If you think that your pet has eaten watermelon seeds and is suffering from an intestinal blockage, get them to a vet. A professional will be able to run further tests and advise on the best possible course of action. Be prepared, though – depending on how severe the obstruction is, surgery may be required to remove the offending seeds from your dog’s digestive tract. Yes, there is no reason why a puppy cannot enjoy watermelon. The many and varied health benefits that the fruit provides may well be great for a growing body. Just be very aware that the precautions that we mention surrounding adults dogs go double for their younger brethren. As a pup’s stomach is still growing and their digestive system is not yet fully formed, it’s best to be particularly vigilant about removing seeds and rind, and not overfeeding them this fruit. Restraint and understanding of their limitations are not strong points for any puppy, so the onus will be on you to understand when enough is enough, and stop feeding them accordingly! Can You Give Dogs Watermelon Juice? You could juice up a watermelon at home using a kitchen gadget, and that is one way of eradicating the rind and seed problems so prevalent with the fruit while it’s whole. However, also bear in mind that watermelon is packed with no shortage of sugar, and the juices contained within will be no different. Don’t make the mistake of thinking that you can juice an entire fruit. What you can do, however, is use watermelon juice to make some great frozen treats for your dog in the summer. Try freezing small quantities of the liquid in an ice cube tray and offer them to your dog to help them cool off, or freeze a more substantial portion into a homemade popsicle that your dog can crunch upon and work their way through. You could even fill a Kong or another kind of hollow toy with watermelon-flavored ice, and let your dog lick their way through the treat. You can also pick up watermelon juice (and other watermelon-flavored treats) by the carton from the supermarket, but it is very much inadvisable to pour any of this into your dog’s bowl. There is no way of knowing how much sugar or any other kinds of colorings or preservatives have been included in such a product, and they are not designed for canine consumption. If you want your dog to enjoy some liquid refreshment with a watermelon kick, make your own. Does Watermelon Cause Allergies in Dogs? If you suspect that your dog is having an allergic reaction to watermelon, you should stop them from eating any more of the fruit with immediate effect. You should also take your dog to a vet as quickly as possible for an assessment, and any medications that may be necessary. You can also try offering a little Benadryl to ease the symptoms of the allergy, using the ratio of 1mg of medication per lb. 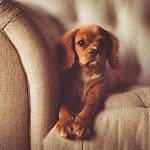 of body weight for your dog – but if you have never given this remedy to your dog before, they do not appear to be in any danger, it’s best to wait for professional advice. For many people, cantaloupes and watermelons are two sides of the same coin. The same applies when deciding whether to feed this fruit to a dog, as the nutritional values – and inherent risk factors – are almost identical. However, it should be noted that cantaloupe contains more sugar than the average watermelon. This means that, although a dog with a sweet tooth will likely go crazy for the taste and request more and more, you’ll have to make sure that you do the calorie-counting on their behalf! Also like watermelons, you will have to care about allowing a dog to eat the rind of a cantaloupe. It will be extremely tough to chomp through and could lead to an upset stomach if your dog is not used to the experience. Also, be vigilant about removing any pesky seeds that have stubbornly clung into the interior of the fruit once you’ve cut it open. What Other Fruit is Safe to Feed My Dog? If your dog develops a taste for watermelon, you may want to look into other fruits that you can feed them. After all, a carefully moderated serving of fruit can make for a great treat, and although many of the fruits available in any supermarket contain no shortage of fruit, they’re often healthier than traditional dog treats. Pears – chopped into cubes. Blackberries, Raspberries, Strawberries, and Blueberries – offer maybe two or three berries as a superfood treat. Bananas – cut down to roughly one inch. Pumpkin – fresh pumpkin can be filled with nutrients. You can also use the seeds, but never feed them raw – always roast pumpkin seeds before offering them to your dog. Cranberries – two tablespoons of stewed cranberries can be great for your dog’s urinary tract. It’s essential that these snacks are consumed in moderation. Too much sugar can leave a dog at serious risk of canine diabetes, and it’s essential that your dog’s diet remains balanced. Some breeds are more susceptible to diabetes and other nutritional deficiencies than others, so it may be worth consulting your vet before deciding to feed your dog fruit. Also, remember that too much fruit can play havoc with a dog’s digestion, If you insist on offering these items as snacks and treats, be prepared to deal with any potential consequences as and when they occur. What Fruits Should I Never Feed My Dog? Fruit isn’t a healthy catchall option for dogs, and just because your pooch reacts well to watermelon, it doesn’t mean that you can engage in a free-for-all from the fresh produce department in Whole Foods. Some fruits are outright toxic and hugely hazardous to your hound’s health. Cherries – Cherry plants contain cyanide, which can poison your dog in no time at all. Tomatoes – even though a dog would have to eat a relatively substantial amount of tomato to grow sick, they do not offer enough nutrition to make it worth taking any chances. Avocado – this may be hugely healthy for humans, but the flesh of an avocado is toxic to dogs. It should go without saying that they should also steer well clear of the stone found inside. Grapes – Grapes are just as lethal to a dog as chocolate or xylitol, threatening immediate kidney failure. Always keep these fruits away from your pet. If you notice your dog sniffing around any of these foods, you should remove them from temptation. The canine brain is not hardwired to understand and avoid foods that will do them harm, and the sweet and appealing smell may get their mouth watering. That will not end well for anybody. If you have any reason to suspect that your dog has eaten any of these fruits, then remain calm but get them to the vet as soon as you can, even if your dog seems to be acting perfectly normal. Don’t take a wait and see approach, as 24 hours could be too late – there could be a sudden and unexpected reaction to these deadly snacks. Watermelon is a fantastic summer treat for dogs as well as humans, and it’s an essential component of any picnic basket when you’re enjoying a day in the park or at the beach. H owever, you’ll also need to make sure that you trim away that rind and pluck out any seeds, or your poor dog will suffer some intestinal consequences. Once you have got into good habits and mastered this, however, there is no reason why your pet shouldn’t get to tuck into this delicious fruit. Offering hydration as well as health, it’s a great way of keeping a distracted dog that shows no interest in their water bowl from overheating. And if there’s enough left for you to enjoy afterward, that’s just a bonus. What Are the Pros and Cons of Sleeping with Your Dog?